Here is the Carter Fab & Machine shop buggy. The build was completed in 2012 and was a collaboration between Dinky R/C, Vanquish Products, and CFM. The main chassis design came from the off-road shop Wide Open Design and their 4 seater Revoulution chassis. there were some minor design changes but they were also pulled from other W.O.D designs. 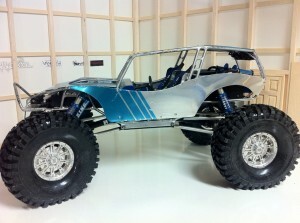 Dinky R/C was contacted to build the custom tube chassis for this wild ride. They have years of experience in scale tube chassis fabrication and always pull off really clean work. Vanquish Products was brought on for their bulletproof axle upgrades and licensed KMC XD Hoss wheels. There is a full write up on the truck on rccrawler.com as well as tons of information and threads full of all your R/C crawling needs.